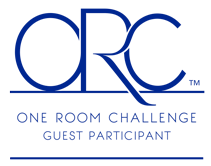 The One Room Challenge continues with some amazing decorating happening! Have you visited the links at Linda's blog? There are ladies who are building on to their houses and everything!! In the last few days, the artwork has been moved to another wall. Lamps have been shuffling around the house. I have used my supreme Stitch Witch ironing skills and made a cord cover for the lamp. My brother was subjected to Ikea when we passed through Round Rock, TX the other day. We bought a chair for the guest room. I have vacuumed the room and stared at it endlessly because it's coming together beautifully. in this room. Woo hoo! Happy about that. Carry on now and have a wonderful week. Thank you everyone for your sweet comments here and on Facebook. What's the one thing that you think every guest room should have? Why, a guest, of course ;) Maybe I should come spend the night! You are making great progress! I think every guest room should have a place to set a suitcase, other than the floor and closet space with hangers. So nice when you can finally use something you've had in storage! The most important thing in a guest room is a comfortable place to sleep! One thing I appreciate when visiting a friend is a bit of closet space and perhaps an empty drawer or two so we don't have to live out of a suitcase. A chair...I think it gives a guest a nice place to retreat to for a bit! Can't wait to see the reveal...and yay for stitch witchery! I didn't realize that you were part of the ORC! How fun! I will have to continue to follow your progress. I know your guest room will turn out great. Great job! I think having great pillows to sleep on, a carafe and glass for water (yes, I drink a lot of water!) recent magazines and a throw to curl up with. It is all those wonderful baby steps that make us proud and make progress in our homes! I can't wait to see your reveal photos. I've made no progress...LOL...no vanity! Hugs!! No surprise, I love it! Stacey, it looks like everything is coming along nicely. What is the one thing every guest room should have? I think the grace and love you give to your guests speaks far more than a particular item in a room. If your guests feel loved....then the room is the icing on the cake, in my opinion. The first thing that popped into my head for what every guest room needs is an empty drawer, then hanging space in a closet. The room is coming together very nicely, and I'm looking forward to seeing the wall cabinet that's been hiding. Let me know the next time you go to the Round Rock Ikea! You were so close to me! It would be so fun to go shopping together! Can't wait to see it all done. A book, carafe, and a cozy lap quilt. It's looking great so far! Can't wait to see the reveal! Have a wonderful weekend! 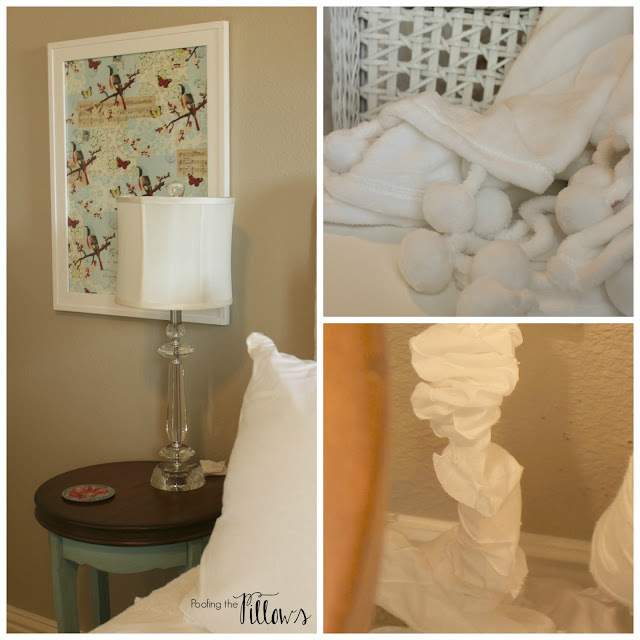 I think every guest room should have a bottle of water, glasses, and an extra blanket, especially this time of year. I love the pretty touches. Always fun to have guests to appreciate your room! Hi Stacey, Your guest room is looking beautiful. I think every guest room needs an empty dresser drawer, mirror, a cozy extra throw, magazines and a welcome basket with some goodies. It's fun to watch this :) As to the question, I'd say a book or two or some magazines and a quilt or throw at the foot of the bed? That throw with the pom poms is lovely and I've always been a fan of cord covers for lamps. I just think it's little touches like that, that make a room super cozy. My guest room is still a work in progress - the bed is there and a piece of furniture and curtains but there is NOTHING hanging on the walls. It feels unfinished - but there were so many other things to do when I moved in!!! I'm excited to see more of your guest room to get inspiration! I love having a little framed sign with the WiFi login and password in a guest room. Along with a couple of bottles of water, granola bars, magazines, tissues. And of course towels, an extra blanket, and a clean fluffy robe and slippers. That throw looks amazing. I can't wait to see.